I picked up the Beretta Px4 Storm - Type F at my local Academy Sports store in Fort Smith. Knowing the reputation of this gun, I have recommended it to quite a few people over the last couple of years. 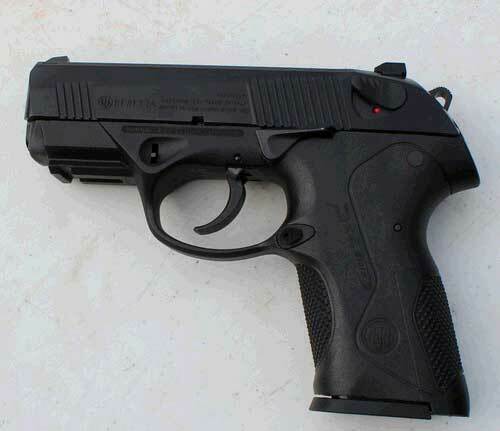 Not unfamiliar with it, the pistol is an evolution of the former Beretta Cougar, now produced by Stoeger Industries. I owned a Cougar around 8 years ago, and was impressed with the gun then. My admiration for its cousin, the Px4 Storm is even more pronounced. With a few style updates, and a polymer frame replacing the former gun's all metal frame, it's lighter and leaner, with more options for the grip. Add to that Beretta's up front claim: "This is because it is engineered to be absolutely reliable and ultra-durable, and it is capable of shooting well over 100,000 rounds without any part breakage." And you've got something pretty impressive in your arsenal. As noted in the picture of the gun, the safety switch, for better or worse, is on the slide. The Model F designates the gun with a safety/decocker combination. When the gun is cocked, pushing the safety lever all the way down decocks the hammer and makes the trigger inert. The gun is in full safe mode. Pushing the lever back up leaves the gun safely decocked but ready to fire. As with all DA/SA guns, the first shot from the decocked position is a long, heavy double action trigger pull, followed by subsequent single action until the gun is decocked again. 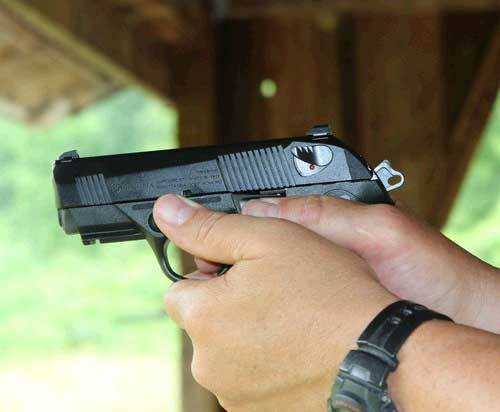 As with any gun of this type, the first, long, heavy trigger pull from the decocked position is challenging to master. But mastering it will provide versatility in a single semi automatic handgun that is unmatched in other types. A feature that makes this gun unique is Beretta's rotating barrel that turns from side to side as the pistol action works. This feature does not lessen recoil, but makes it more manageable with more of a straight backward push into the hand instead of muzzle flip. 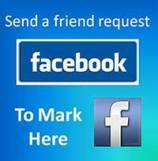 It provides a first time out of the box shooting experience that is noticeable. Carrying the compact Beretta Storm is easy with a standard inside the waistband holster. It will also work well in a belt holster provided a sufficient cover garment is worn. In a backpack, tackle box, or briefcase the gun will provide a dependable, accurate self defense tool. 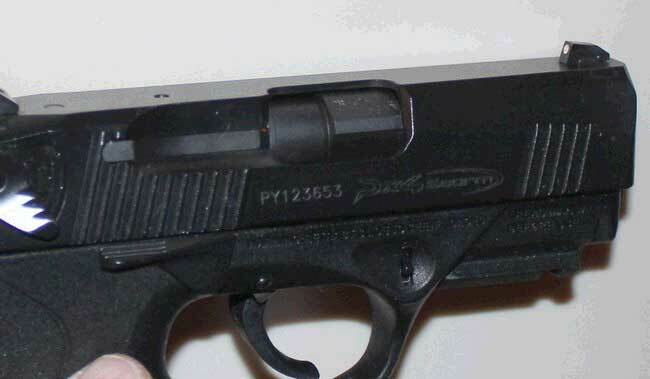 Note in the picture above the Beretta Px4 Storm's unusual view of the barrel through the ejection slot in the side. Instead of the usual smooth surface of the barrel, you see a stair-step ridge that is part of the shape that makes the barrel's unique action. 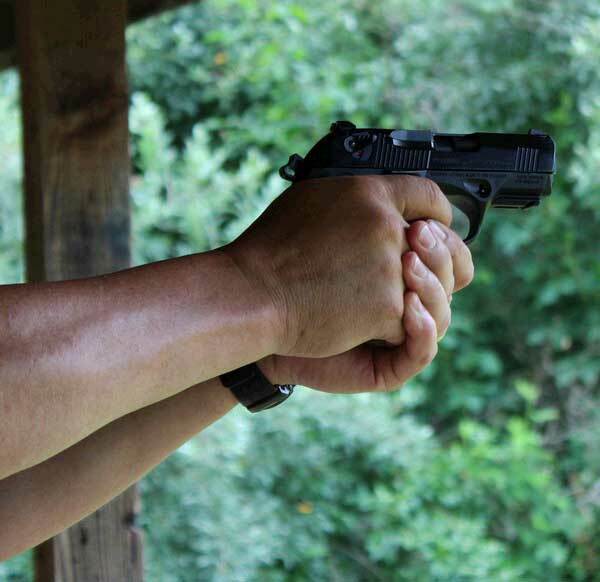 The Px4 Storm sports a polymer frame making it lighter than its predecessor. The gun, out of the box, fit my hands just right with no adjustment needed. It clearly will fit a wide range of hand sizes with Jacquilyn picking it up and managing it easily in her much smaller hands. The immediate results spoke for themselves. Shooting from about 30 feet, shots went straight where the gun was pointed. Round targets, the silhouette, bowling pins, canned soda, plastic bottles full of ice all received the wrath of the gun. 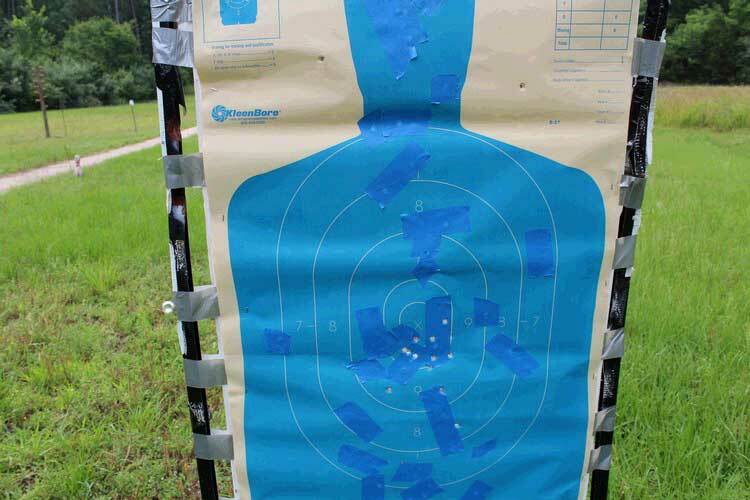 Most shots were taken in practical mode, firing quickly with minimal sight alignment. 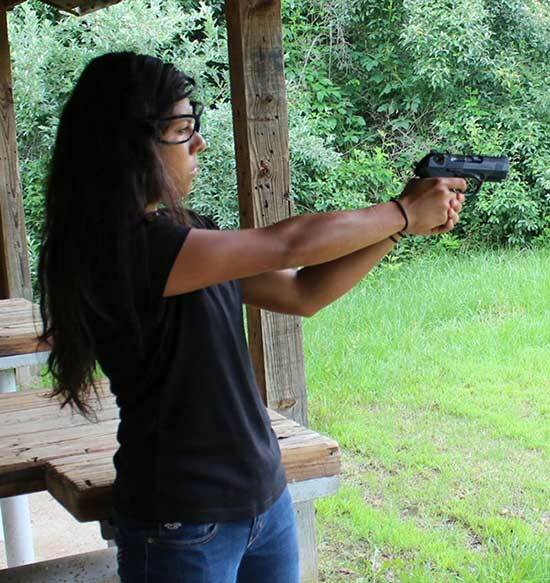 All shots made standing with a two handed grip. 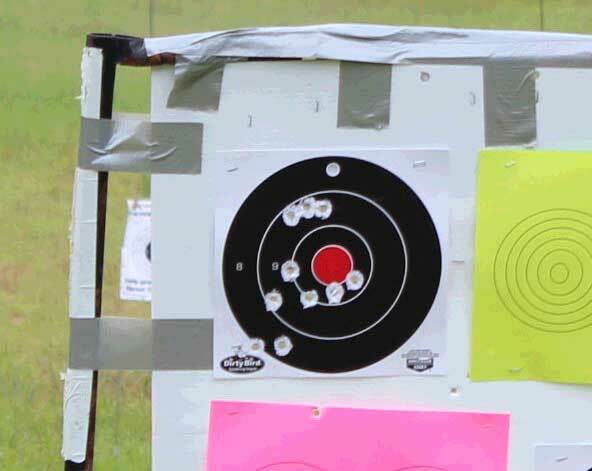 A couple of spinner and steel targets were placed at about 25 yards and were regularly spun and clanked by the 40S&W ammo. We fired around 200 rounds through the gun. Most of that was Remington factory ammo, along with some of my reloads. It managed all without a problem. The gun comes with everything shown. Carry case, two magazines, three back strap adjustment strips, lock, load assistant, manual. 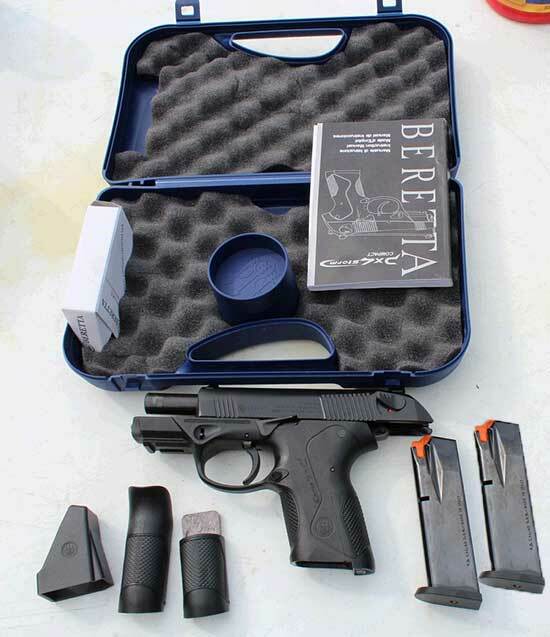 Beretta Px4 Storm, Type F Summary: This is a gun I was happy to shoot straight out of the box. It didn't take any of the get-used-to-it time that most guns take. A single magazine through it, and I felt like a lifetime owner. This along with the gun's versatility, and Beretta's renowned reputation for high quality, long life firearms makes this one that easily fits within the best in class category.